It is not for me. You don’t come to worship to get anything out of it. We don’t do that, worship is only for God and God only. We come here to worship God and to lift up his name. Of course, ultimately, we get benefit out of it, but we don’t come here to get something out of it. We purely come to give worship to God. Give everything to God. So, as you come to worship, let us come with that heart, with a prepared heart, that we gave our self as a living sacrifice to God. Today is the first Sunday of Lent. Last Wednesday was Ash Wednesday, starting from Ash Wednesday for 40 days it’s called a lent. We’re reflecting on Jesus’ suffering and sacrifice for us, during this Lent. The first thing that Jesus experienced during lent was the temptation. So, I’m going to reflect on the reality of temptation with you today. Well, I read this passage, I was always curious as to why did the spirit drive Jesus into the wilderness? Why did the spirit do that? Because wilderness is not a good place. It is a place where there’s temptation, it is a dark place. You’re vulnerable in the wilderness and the wilderness, not a place that you want to be, and you want to get out of it as soon as possible. But why did the Spirit a send or drive Jesus into the wilderness to be tempted? The Greek word drive here is a very intense word. Almost violent. It is called Ekballo. It means chase out it, drive out. Chase out into the wilderness. The spirit chased Jesus out into the wilderness. When Jesus healed the demon-possessed person, Jesus chased out, like Ekballo that kind of intense, violent of a word. With that, the same with the same intensity the Spirit drove Jesus into the wilderness on baptism. The spirit came down like a dove. Very gentle image. Spirit came down like a dove on Jesus at baptism, but all of a sudden, the Spirit change and drove Jesus out into the wilderness. 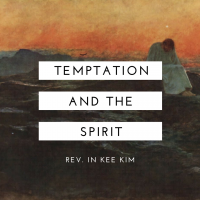 Did the Spirit tempt Jesus? We all know very well that God does not tempt us. God does not tempt you in any way. God does not make you fall in any way. That is not the God we believe in. Our God never tempts us. This is what James said, “no one when tempted should say, I am being tempted by God, for God cannot be tempted by evil and he himself tempts no one.” Then if God does not tempt us, why did the Spirit drive Jesus into the wilderness. And I was thinking about the reality of temptation. I was thinking whether we can escape or avoid temptation in any way. Can you avoid temptation? Can you live without temptation? No. No matter what we do, we are bound to face temptation in your life. No matter what you do, you will experience temptation. And it’s sometimes very hard, sometimes easier, but we all face temptation. When you’re face temptation, I hope that you don’t give up. You don’t give in. After baptism, Jesus was about to start gospel work, but right outside of the door, the temptation was waiting for Jesus. Whenever you try to do something good, the temptation is always right there to disturb you. Let’s say, okay, this year I’m going to be a better Christian, and at that moment there is a temptation that makes you go astray. That that is our life. The temptation is real. We all faced temptation. Now I understand why the Spirit drove Jesus into the wilderness. If the temptation is something that you cannot avoid, then you must face it. That’s why Jesus, a Spirit drove Jesus into the wilderness. To face it face to face. Jesus had to confront temptation face to face. That’s what you got to do. If temptation is a reality that you can never escape or avoid then you must confront temptation. Face to face. Don’t beat around the bush. Don’t try to run away from temptation, but confronted face to face. We must see what pulls us down, what presses us down, and we have to confront what blinds our eyes so that we not see. What is that temptation that really pushes you down? That stops you from becoming what you’re supposed to be. What is their power? What is that real reality that does that to you? Not to live as a precious child of God? Once confronted, you’ll see the reality of temptation as naked as possible. You’ll be able to start seeing that. When Jesus was driven into the wilderness and confronted temptation, he was able to see what temptation looked like, what real temptation was like. Mark doesn’t record that, but Matthew and Luke record that. The order is different between Matthew and Luke, but those three things, Jesus was able to see very clearly. The first one was considered the bread more important than God’s word. In other words, survival. Survival is the most important thing. Probably this is the most difficult thing. Difficult temptation to, uh, overcome survival. We feel with our skin and when our survival is at risk, then we get easily tempted. So, survival is the most important thing. The bread is more important than anything else. Two, I’ll give you the whole world. It is a temptation of greed. Many people fall into this temptation. Greed, we want to be great. We only have more. All the time greed is around us. Instead of having a pure desire, we always have this greed for fame and reputation and for material possession all these things. And third, will God really helped me when I come down from the pinnacle of the temple? In Matthew that comes at the end, but in Luke, it comes in the in the middle. Will God help me is a temptation of doubt. When you go through a dark time, a difficult time, you wonder will God help me? Even though God has helped you all this time when you face a new problem, you ask that question again will God be able to help me? When Jesus confronts the reality of temptation face to face, these things were visible. He was able to see what was bothering him. But this reality temptation is not just for Jesus but also for all of us. I realized that the Spirit is not always gentle and good. Spirit does not always take you to a good or comfortable place. Spirit is not always like a dove. Whenever we talk with Spirit we draw doves. The Spirit is not always like that. Sometimes Spirit takes you into the dark reality of temptation. You don’t like it, but that’s real. That’s what Spirit does. The Spirit that we created, we manufactured, always takes you good in a good place. But real Spirit does not take you to a good place. Sometimes the spirit leads us into deep loneliness, sometimes in into self-doubt, sometimes into the cloud of unknowing and sometimes into thinking that everything is in vain. Temptation cries out life after death. Ridiculous. There is no life after death. Death is the end. The temptation will say that. In KSM last Wednesday, I was kind of emotional because when I looked around, I saw some older members. I’ve been with them for a long time. They were session members and I looked at them, they were on the verge of death and then they will face the greatest temptation at their deathbed. And then I said to myself, I need to prepare them. I need to prepare them with faith so that they can face their own death, like confidence and faith. Then I got emotional when I thought about them. The temptation will cry out. There’s no life after death. Death is the end. And sometimes temptation cries out no matter how hard you try, that’s no use. You won’t be able to make. It doesn’t matter how hard you try, you won’t be able to make it. And sometimes things don’t work out well. Difficult things happen repeatedly even in our church. This year theme is Healing through Worship and we put the worship as the center. Less in ESM, but in KSM, a lot of hindrances. Some people got into conflict. I don’t know why they do that and all kinds of things were happening things after one after another so that we don’t have meaningful worship. Sometimes instead of facing the reality of temptation, they completely ignore it. Don’t think about it. If I don’t think about it, I don’t fall into temptation, so they don’t think about. They avoid it. They run away from temptation. Sometimes people drink to forget about temptation. Some people just work and work and work to think about anything else. Just work hard and your life will be okay. They’re just scared of temptation, so they try to run away from it. And the result is numbness. You don’t even know what you feel. Total numbness, but the Spirit drives us into the wilderness because we doubt going through the wilderness we can never enter the promised land. But without the wilderness, you cannot live a meaningful life you’re supposed to live. Right now, the Winter Olympic is going on and the figure skater couple Duhamel and Radford won the bronze medal. At the last Olympics they came in seventh place and they said in an interview, “during this practice, in the middle of it, they said to each other, we’re done. Our Olympic career is done. We can never make it.” But there was a temptation and they overcame it. They practice and practice. Suddenly, things got together, and they started believing in themselves. Had more confidence. And then finally at the Olympic, they got the bronze medal. I think life is like that. No matter what you do, nothing comes easy though. No one lives an easy life. To live a good and meaningful life we must go through the wilderness of temptation. As you go through the wilderness of temptation, there’s one thing that you must do that is trusting God. It is very concrete advice. When you go through temptation, trust in God. You must learn to trust in God. The wilderness of temptation is the best place to learn how to trust in God. Saint Paul taught us about temptation. This is what it said. No testing has overtaken you. That is not common to everyone. God is faithful, and he will not let you be tested beyond your strength, but with the testing, he will also provide the way out so that you may be able to endure it. If you’re just running away from temptation, you will never learn to trust in God. In times of trials and temptation, you must learn to trust in God. Running away from temptation is a cowardice. Lack of courage brings only regrets. Are you going to live a life with regrets, or are you going to overcome your temptation and live it fully? I want all of you to live a meaningful life, whatever you do. And to do that, you must persevere through temptation. Let us not be scared of temptation. Why be scared? Because God promised that you’ll never be tempted beyond your ability. And God will give you the strength and God will show you a way out when you go through temptation. So, when temptation comes to you, learn to trust in God. God will give you strength and God will show you the way out. Boldly move forward with your life. Obstacles are there for you to go over. Obstacles are not there for you to avoid. They are there for you to go over. You’ll become stronger. Don’t be frightened with small waves. You’ll be able to handle even the big waves. Be a bigger person. Be a bigger person. The only way to do it is to fight against temptation, to overcome your temptation with God’s strength. Let us sing together.